The article noted that Korean refiners were trying to sell products to China, Taiwan, and Japan. It added that Korea’s exports to China rose fourfold between January and October, while its share of the Chinese gasoil import market went from seven to twenty-six percent. The Asian refining center in Singapore lost market share, falling from seventy-five to twenty-six percent. I cover oil, gas, power, LNG markets, linking to human development. Things have warmed up amazingly quickly: "Long Johns to Short Sleeves: Rapid Thaw Follows Polar Blast." Natural gas prices started the winter season with a bang, but could end it with a whimper. Henry Hub natural gas prices spiked last November to multi-year highs, nearing $5/MMBtu. The extraordinary drawdown in inventories left the U.S. with the smallest cushion of gas supplies in over 15 years. A cold snap threatened to push gas supplies to dangerously low levels, and eyeing that thin margin, prices jumped and volatility spiked. 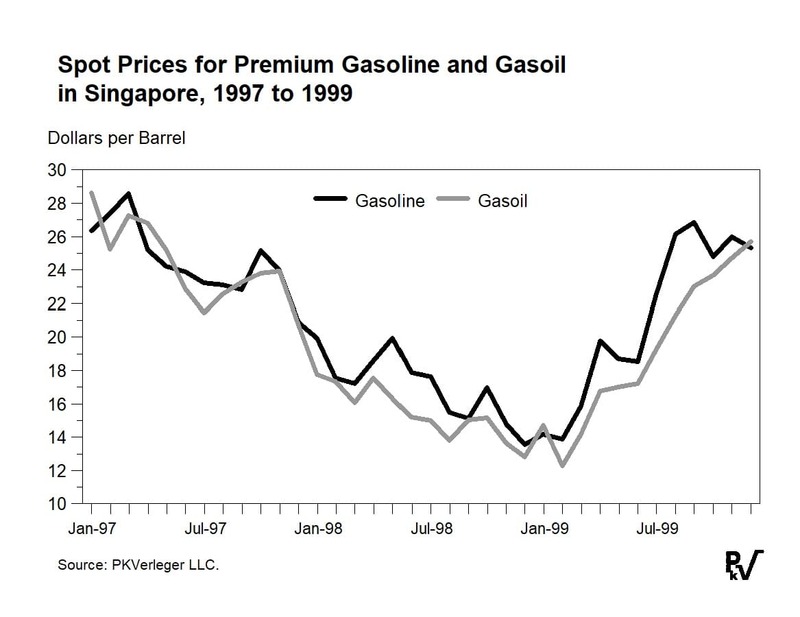 The surge in prices was brief, however. Winter got off to a mild start, and demand was relatively muted as well. The record-setting cold at the end of January saw demand spike once again, but the market barely budged. Everyone knew that the Polar Vortex, though intense, was only going to be around for a limited period of time. A massive upswing in temperatures occurred at the start of this month, with much of the country thawing out. Now, although we have a few weeks left of the high-demand winter season, the end is within sight. After all, Punxsutawney Phil didn’t see his shadow. The investment bank lowered its pricing forecast for the first quarter of 2019, predicting average Henry Hub prices at $2.98, down sharply from its previous estimate of $3.51/MMBtu. For the full year, the bank expects prices to average $2.81/MMBtu. As it stands, front-month natural gas prices were trading as low as $2.67/MMBtu on Wednesday. “Since October, we have been warning about higher volatility, but with heating demand on a downward slope and acute storage scarcity largely out of the picture, we believe volatility should decline towards historical averages into this summer,” Barclays added. One notable development is the emergence of a stronger inverse relationship between WTI prices and the price of natural gas. The higher WTI goes, the worse off it is for natural gas prices. That may seem counter-intuitive since the two fuels have, at times, had a positive correlation. A general rise in commodity prices, whether due to a booming economy, or asset price inflation, or supply shortages, can affect both oil and gas in the same way. Because of this link to the oil market, the fate of oil prices will have significant influence over the behavior of natural gas. For instance, if U.S. oil production growth slows to just 0.6 million barrels per day – well below the 1.2 mb/d the EIA is forecasting – that would push natural gas prices up roughly $0.50/MMBtu relative to Barclays’ baseline scenario, due to lower associated gas supply. On the other hand, if the shale industry surprises and adds a rather massive 1.4 mb/d of new oil supply, that would lead to a surge of associated gas production as well, pushing Henry Hub prices down by $0.20/MMBtu relative to the reference case. Overall though, prices should be muted this year. Winter demand season is coming to an end and shale gas production continues to rise. That will allow inventories to be replenished, dramatically reducing the volatility and risk associated with tight supply conditions. The rise of U.S. tight oil production over the last several years has upended the oil market and challenged OPEC’s hold on oil prices. This seemingly relentless growth in U.S. tight oil production has created the impression that oil prices will remain forever capped as each price spike is met by a massive wave of US tight oil supply. U.S. tight oil supply has grown from a mere 500K barrels in 2010 to just under 6M barrels in 2018. Following the oil crash of late 2014, U.S. tight oil growth experienced a brief pause in 2015-2016 before resuming its growth in 2017 and climbing to a new high by 2018. This latest growth spurt to a new record is even more impressive when we take in consideration the fact that WTI averaged $65 a barrel in 2018 as compared to $95 a barrel in the three years (2012-2014) preceding the oil crash. Most observers attribute this strong shale industry performance to technology and improved drilling and completion practices. We are told that American oil and gas companies have become more efficient. The widespread utilization of pad drilling, the introduction of longer laterals, pumping ever more sand per foot, closer and better well spacing, and smart fracture targeting are often mentioned as the driving factors behind the industry record beating performance. This narrative of technological prowess and innovation is an attractive one, but a deeper examination of the data reveals a different picture. This fallacious narrative of the U.S. tight oil industry overcoming the oil price crash of 2014 through innovation and better efficiency is the product of bundling various tight oil basins under one umbrella and the presentation of the resulting production data as a proof U.S. shale resiliency. To properly understand the impact of the oil price crash of 2014 on U.S. tight oil production one must focus on shale basins with sufficient operating history prior to the oil price crash and examine their performance post the crash. To that end, the Bakken and the Eagle Ford are the perfect specimen. The Bakken and the Eagle Ford are the two oldest tight oil basins in the United States, with the former developed as early as 2007 and the latter in 2010. Examining the production performance of these two basins in the 4 years preceding the oil crash and contrasting it to the 4 years subsequent to it, offers important insight as to the resiliency of U.S. tight oil production in a low oil price environment. Both the Bakken and the Eagle Ford grew at a phenomenal rate between 2010 and 2014. The Eagle Ford grew from practically nothing in 2010 to 1.3M barrels by 2014, while the Bakken grew five fold from 190K barrels to 1.08M barrels. Following the collapse in oil prices in late 2014, the Bakken and Eagle Ford growth continued for another year, albeit at a slower pace, as the pre-crash momentum carried production to new highs. However, by 2016, both the Bakken and the Eagle Ford went into a decline and have hardly recovered since. It took the Bakken three years to match its 2015 production level, meanwhile the Eagle Ford production remains 22% below its 2015 peak. During the pre-crash years these two fields grew by a combined yearly average of 600K to 700K barrels from 2012 to 2014. Post the oil price collapse, this torrid growth turned into a sizable decline by 2016 before stabilizing in 2017. Growth in both fields only resumed in 2018 at a combined yearly rate of 210K barrels, a 70% reduction from the combined fields pre-crash growth rate. The dismal performance of these two fields over the last few years paints a different picture as to U.S. tight oil resiliency in a low oil price environment. The sizable declines, and muted production growth in both the Bakken and the Eagle Ford since 2014 discredit the leap in technology and the efficiency gains narrative that has been espoused as the underlying reason beyond the strong growth in U.S. oil production. As we expand our look into other tight oil basins, it becomes apparent that it was neither technology or efficiency that saved the U.S. tight oil industry, although these factors may have played a supporting role. In simple terms, the key reason as to the strength of U.S. production since the 2014 oil crash is better rock, or rather, the commercial exploitation of a higher quality shale resource, namely the Permian oil field. The Permian oil field, unlike the Bakken and the Eagle Ford, was a relative latecomer to the U.S. tight oil story. It was only in 2013, only a year before the oil crash, that the industry commenced full scale development of that giant field’s shale resources. Prior to 2013, the Permian lagged both the Bakken and the Eagle Ford in total tight oil production and growth. As can be seen from the preceding graph, the oil crash had only a minor dampening effect on the Permian oil production growth. By 2017, Permian tight oil growth resumed at a healthy clip, and by 2018, Permian tight oil production growth shattered a new record with production skyrocketing by 860K barrels in a single year to 2.76M barrels. This timely unlocking and exploitation of the Permian oil basin masked to a large degree the devastation endured by the Bakken and the Eagle Ford post 2014. In essence, the U.S. tight oil story has two phases masquerading as one: the pre-2014 period marked by the birth and rise of the Bakken and Eagle Ford, and the post-2014 period, marked by the rise of the Permian. To speak of the U.S. tight oil industry as one is to mistake a long-distance relay race for the accomplishment of a single runner. Related: Which Oil Giant Generates The Most Cash? The performance divergence between the Bakken, Eagle Ford, and the Permian has major implications as to the likelihood of U.S. tight oil production suppressing oil price over the medium and long term. A close examination of U.S. tight oil production data leads to a single indisputable conclusion: without the advent of the Permian, the U.S. tight oil industry would have lost the OPEC lead price war. Hence, it’s a misnomer to treat the U.S. tight oil industry as a monolith, in many ways, the Bakken and the Eagle Ford tight oil fields are as much a victim of the Permian success as the OPEC nations themselves. Considering that the majority of U.S. tight oil production growth is generated by a single field, the Permian, changes in the growth outlook of this basin have major implications as to the evolution of global oil prices over the short, medium and long term. Its important to keep in mind that the Permian oil field, despite its large scope, is bound to flatten, peak and decline at some point. 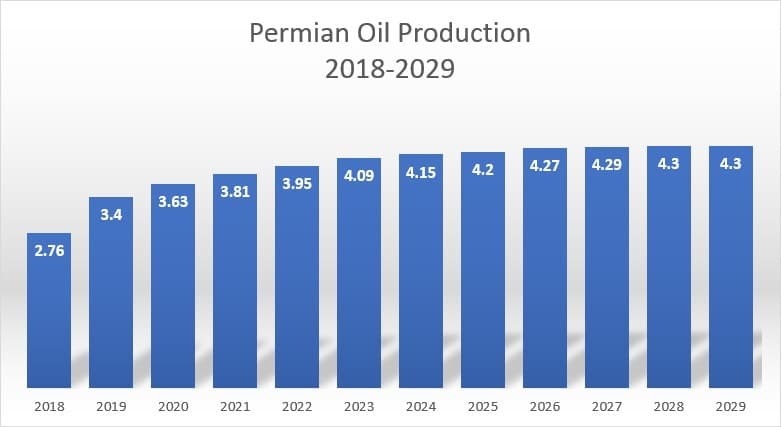 While forecasters differ as to the exact year when the Permian oil production will flatten, the majority agree that a slowdown in Permian oil production growth will take place in the early 2020s. There are many factors that can accelerate or delay the projected flattening phase, but there is no doubt that sooner or later Permian oil production will flatten. 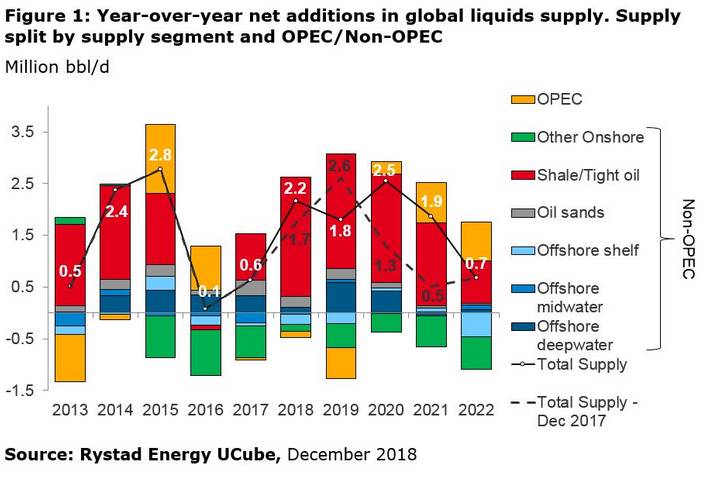 An eventual plateau in Permian oil supply effectively translates into a flattening of non-OPEC global oil supply, the importance of this event can’t be overstated. The year the Permian flattens is the year OPEC will regain control of the market, this seminal event will have major implications on long term oil prices. There is no doubt that Saudi Arabia and Russia are aware of the Permian growth and flattening dynamic and are co-managing their oil supply over the short term and medium term to allow for an orderly entrance of U.S. tight oil supply, aka Permian oil supply, into the market. It’s indeed telling that OPEC is attempting to extend its alliance with Russia for another three years, exactly the time window required for growth in the Permian oil field to flatten and for pricing power to return to it. The U.S. tight oil story is far more complex than meets the eye, and the oil market, like any market, is prone to the appeal of simple narratives and false conclusions. Those willing to drill behind the headlines stand to capitalize on the treasures buried in the details. If the Squid is predicting UP for the low hanging fruit, count on it going down. At the start of the year, the investment bank had reduced its outlook for oil prices this year citing abundant supply. Back in early January, Goldman expected Brent Crude to average US$62.50 a barrel this year, down from an earlier projection of US$70 a barrel. WTI Crude, according to Goldman Sachs, will average US$55.50 a barrel, compared with an earlier estimate of US$64.50 a barrel. Very convenient timing for this "accident". At 12:33 GMT, April natural gas is trading $2.873, down $0.012 or -0.42%. Traders continue to toy with the technical target area at $2.812 to $2.871. Reaction to this zone is likely to determine the near-term direction of the April natural gas market. With the return of warmer temperatures, we’re looking for weakness to develop on a sustained move under $2.871. If the selling pressure increases then look for the selling to possibly extend into $2.812. April natural gas will be particularly vulnerable to a break under $2.812. This move could trigger a steep break into $2.731 to $2.691. The United States Natural Gas Fund L.P. (UNG) was trading at $24.94 per share on Wednesday afternoon, down $0.49 (-1.93%). Year-to-date, UNG has gained 6.95%, versus a 4.49% rise in the benchmark S&P 500 index during the same period. ️ Natural Gas Prices Are Crashing as Market Suffers ‘Winter Hangover"
Natural gas prices are collapsing across the globe as supplies from the U.S. to Australia flood the market, sparking concern some exporters will have to curtail output and raising questions about new investments. While prices typically ease at this time of year as mild weather in the northern hemisphere crimps demand, a boom in output of the heating and power-plant fuel is exacerbating the slump. The crash comes as the world’s biggest energy companies are set to gather at the LNG2019 conference in Shanghai next week, with many considering whether to move forward with a wave of massive, multibillion-dollar liquefied natural gas export projects. Global trade is already shifting as lower prices wipe out the economics of sending U.S. gas to Asia and boost Europe’s appeal as a market. New LNG production from Australia, Russia and the U.S. has helped to push prices in Asia more than 50 percent lower this year after a warmer-than-normal winter. Even as concern about climate change drives a shift to cleaner-burning gas from coal, demand isn’t growing fast enough to absorb the supply surge. Asia’s LNG benchmark, the Japan-Korea Marker, has more than halved since the start of the year to $4.375 per million British thermal units as of March 26. It’s fallen to a rare discount to European prices, as U.K. National Balancing Point futures traded at around $4.50 on Friday, down 44 percent this year in their worst quarter in a decade. U.S. gas futures are down more than 8 percent this year, heading for the worst quarterly loss in two years. The gas crash stands in stark contrast to oil prices, which are heading for their best quarter since 2002 as OPEC and its partners curtail production amid a decline in output from Iran and Venezuela. Since gas is produced as a byproduct of crude drilling in places like West Texas’s Permian Basin, the oil rally threatens to exacerbate the gas glut. European gas prices are also dropping relative to the U.S., and if the spread narrows further, American exporters may be forced to cut output, according to Societe Generale SA. The market is collapsing just as more Gulf Coast terminals designed to send LNG overseas are poised to start up, creating the first real test of buyers’ appetite for U.S. cargoes. “Prices could keep falling and stay low for weeks, perhaps until sometime closer to the middle of the year, after the market has adjusted and overcome frictions on the supply, demand and shipping sides,” Citigroup Inc. analysts including Anthony Yuen wrote in a March 28 note to clients. European prices may need to fall more than 15 percent to make U.S. LNG into the region uneconomic and help rebalance an oversupplied system this summer, BloombergNEF analysts said in a report this week. So much production is flooding the market that prices may not begin a sustained rebound until heating demand starts to pick up during the northern hemisphere winter, said Meg Gentle, chief executive officer of Tellurian Inc., which is planning a $28 billion export terminal in Louisiana. The short-term pain may seem at odds with expectations that several developers are now set to announce billions of dollars in investments for new export facilities. That’s because the medium-term outlook calls for the current surplus to shift into a deficit early next decade, which can only be avoided if projects are sanctioned now. Global consumption is forecast to grow 1.6 percent over the next five years, with China accounting for a third of global demand growth to 2022, according to the International Energy Agency. Gas is expected to surpass coal as the world’s second-largest energy source, after oil, by 2030 amid a push to cut emissions. Soon they'll pay you to burn it. ️ Is This The End Of The OPEC Deal? Oil prices ran into a brick wall on Thursday, falling more than 1 percent on news that U.S. inventories jumped and OPEC may be considering an exit from its production cuts. Reuters reports that some OPEC officials are privately rethinking the extension of their production cuts beyond June. To date, the prevailing consensus has been that OPEC+ would need to keep the cuts in place through the end of this year in order to rebalance the market. But the swiftness of the rebalancing effort has surprised most analysts, and has even surprised OPEC itself. Of course, while the group has kept 1.2 million barrels per day (mb/d) off of the market since the start of this year (give or take), U.S. sanctions have knocked even more supply offline in Venezuela and Iran. In March, Venezuela’s oil production plunged by 289,000 bpd, falling to just 732,000 bpd, according to OPEC’s secondary sources. It’s a staggering figure. The widespread blackout, the economic and political crisis, and harsh U.S. sanctions have crushed Venezuela’s oil sector. Meanwhile, Iran’s output has held up a bit better, but has still suffered from significant declines since last year. The expiration of waivers that the U.S. granted to eight countries importing Iranian crude expires in just a few weeks. As of now, Trump officials appear to be split on whether or not to take a hard line by letting the waivers expire. In a sign of how hawkish the Trump administration has become, Secretary of State Mike Pompeo is now viewed as being at the softer end of the spectrum in regards to Iran policy. Pompeo has a long reputation as a hardliner on Iran, so the fact that his department is the one trying to moderate White House policy is telling. Notably, Pompeo’s State Department is worried about rattling the oil markets if the administration is too aggressive on Iran, according to Bloomberg. Meanwhile, OPEC is watching all these events very closely. Saudi oil minister Khalid al-Falih has repeatedly suggested in recent months that the OPEC+ production cuts would likely be extended. The group seems to want to err on the side of overtightening, especially after last year when OPEC+ abandoned the production cuts and the oil market crashed. This time around, OPEC+ will have the benefit of being able to react after the mercurial U.S. President makes a decision on Iran sanctions waivers. The surprise issuance of waivers last year is one of the main reasons why prices crashed in the fourth quarter. If the U.S. takes a hard line, and knocks more Iranian supply offline, and Venezuela continues to see supply losses mount, OPEC could decide to increase production from current levels, according to Reuters. That report follows comments from Russian President Vladimir Putin a few days prior that seemed to suggest that Russia is growing wary of keeping supply off of the market. Putin said that he does not support an uncontrolled increase in prices. Russian energy minister Alexander Novak added that there would be no need to for an extension of the cuts if the market had reached a balance. Meanwhile, on Wednesday, the EIA also reported another surprise uptick in crude inventories. Taken together – Russia’s skepticism, U.S. inventories and now the possibility that OPEC would consider a production increase – the news took the steam out of the recent rally in prices. “Now there is a suggestion that OPEC may surprise us and raise production pre-emptively if we get a price spike,” Phil Flynn, an analyst at Price Futures Group in Chicago, told Reuters. The higher oil prices rise, the more the cracks in the cooperative arrangement will emerge. All it will take is another supply disruption in Iran, Venezuela or Libya to kill off the deal. The U.S. crude oil production juggernaut continues to move forward. In 2018, U.S. production increased 17 percent over the previous year in a dynamic that is impacting both geopolitics as well as setting a new course for American global diplomacy. Annual U.S. crude oil production reached a record level of 10.96 million barrels per day (b/d) in 2018, 1.6 million b/d higher than 2017 levels. In December 2018, monthly U.S. crude oil production reached 11.96 million b/d, the highest monthly level of crude oil production in U.S. history, the EIA said on Tuesday. Moreover, U.S. crude oil production has increased significantly over the past 10 years, driven mainly by production from tight rock formations using horizontal drilling and hydraulic fracturing, hence the U.S. shale oil revolution. The EIA now projects that U.S. crude oil production will continue to grow this year and in 2020, averaging 12.3 million b/d and 13.0 million b/d, respectively. Not surprisingly, Texas is still leading U.S. production, similar to the lead it took up to the 1970s when the state was largely responsible for allowing the U.S. to play the then-role of global oil markets swing producer before ceding that role to a Saudi Arabia-led OPEC for the next four decades. Texas accounted for 40 percent of the national total oil production last year. The state has held the top position in nearly every year since 1970, the EIA added, with the brief exception of 1988, when Alaska produced more crude oil than Texas, and from 1999 through 2011, when production from the Federal Offshore Gulf of Mexico region was higher. Crude oil production in Texas averaged 4.4 million b/d in 2018 and reached a record-high monthly production level of 4.9 million b/d in December. Texas’s 2018 annual production increased almost 950,000 b/d. This growth has been largely driven by output in the Permian region in west Texas. For its part, Permian production represented nearly 60 percent of the total increase in overall U.S. oil output last year. Oil production increases in the Permian region, which spans parts of Texas and New Mexico, also drove a 215,000 b/d, or 45 percent production increase in New Mexico in 2018. This level was the second-largest state-level growth in 2018 and accounted for 13 percent of the total U.S. increase, setting a new annual record production level in New Mexico. The EIA in its most recent Short Term Energy Outlook said yesterday that U.S. crude oil production averaged 12.1 million barrels per day (b/d) in March this year, up 0.3 million b/d from the February average. EIA also forecasts that U.S. crude oil production will average 12.4 million b/d in 2019 and 13.1 million b/d in 2020, with most of the growth coming from the Permian region of Texas and New Mexico. U.S. oil production for its part, is the main factor, along with global economic growth concerns, that is keeping global oil prices from spiking even higher than they have so far this year. Both global oil benchmark, London-traded Brent and U.S. benchmark, NYMEX-traded West Texas Intermediate (WTI) futures are hitting highs amid growing geopolitical turmoil as well as Saudi Arabia and the OPEC+ group of producers continuing to trim oil output in an effort to reduce global supplies further and keep upward pressure on prices. Oil prices hit a five-month high on Monday, with WTI surging above $64 per barrel and Brent topping $71 per barrel. Stellar U.S. production is acting as a counterweight on the supply side of the global oil markets equation, offsetting, at least to a degree, geopolitical problems and more output reductions in Libya as that country is embroiled in fighting around Tripoli, as well as U.S. sanctions against Iran and Venezuela. Without strong U.S. oil production, prices would likely have maxed out north of $100/barrel by now, similar to 2008 when prices hit a record high above $140/barrel. On Monday, the Trump administration, in a move that pleased Saudi Arabia, labeled the Iranian Revolutionary Guards as a terror group, further increasing tensions between Washington and Tehran. "This unprecedented step, led by the Department of State, recognizes the reality that Iran is not only a State Sponsor of Terrorism, but that the IRGC actively participates in, finances, and promotes terrorism as a tool of statecraft,” President Trump declared in a statement. “The IRGC is the Iranian government’s primary means of directing and implementing its global terrorist campaign." On Tuesday, Iran responded in kind. Iranian President Hassan Rouhani denounced the U.S. as the actual “head of global terrorism,” while labeling U.S. forces in the Middle East as a terror group. What now remains to be seen for global oil markets is whether Trump will extend waivers for customers of Iranian oil. The president, however, has put himself in a no-win situation. If he grants more waivers as he did last fall, he will continue to create problems in his once cozy relations with Saudi Arabia, who was taken back last year when he granted the first set of waivers. However, in doing so he will add more barrels to global oil supply and help keep a lid on prices. If the president removes waivers for Iranian oil, then more barrels will be removed from global oil markets, with the knock-on effect of increasing both oil prices and gasoline prices at home just as the 2020 presidential election cycle kicks in.